Russian football fans detained in the German city of Cologne may face up to 10 years in jail on charges of public disorder and inflicting serious injuries, a diplomatic source told RIA Novosti on Friday. BERLIN (Sputnik) – Police held five Russian youths on Thursday after they clashed with Spanish nationals outside of Cologne’s landmark cathedral amid the ongoing Euro 2016 football championship. Another man was arrested as he prepared to board a flight to Ibiza, Spain, and was taken to a police station. "According to out information, the Russian football fans detained in Cologne are facing three charges, which are public disorder, inflicting grievous bodily harm and resisting police. The maximum sentences under these charges are between three and 10 years," the source said. German police found that the six Russians flew into Marseille from Moscow on June 10. They boarded a train from Brussels to Cologne on June 16. The men had football tickets for Russia-England and Russia-Slovakia games, disguise accessories and teeth protection with them. 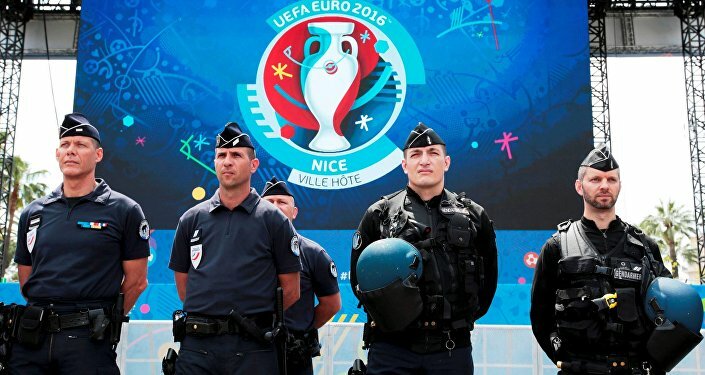 The UEFA Euro 2016 has seen repeated violence with frequent clashes between football fans. Russia’s Euro 2016 opener with England on June 11, which ended in a 1-1 draw, was marred by fan violence as English and Russian fans traded taunts and eventually clashed outside the Marseille stadium. Dozens were charged and deported. Clashes also took place ahead of Wednesday's Russia-Slovakia game. On Wednesday, French Nord Department police said that a total of 16 football fans, including six Russian nationals, had been detained in a new wave of clashes in Lille. The number of detained fans later went up to 36.